Integrate math, social studies, and art with 2 awesome projects! 1. 2D GEOMETRIC TOWN (LINE SEGMENTS) - Explore lines: parallel, perpendicular, and intersecting, as well as the angles they produce when crossed, with a fun project from Math Lesson Plans (listed under "Day 3"). After kids sketch out their map, you can have them add polygons to represent buildings, vehicles, and shrubbery! 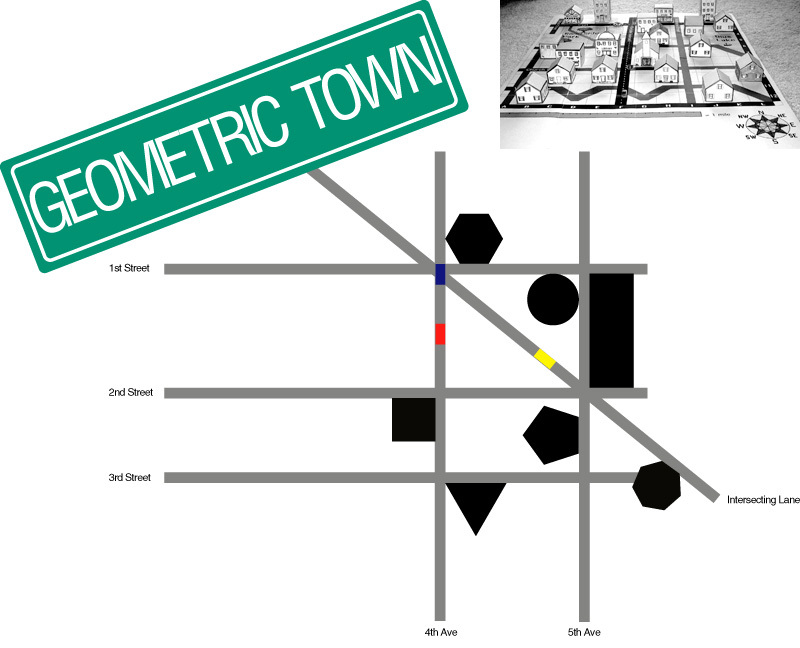 (illustration above) Also, check out ABC Teach Geometric Town Map project (more advanced)! View examples at Engrade and Mrs. Sandri Math. 2. 3D GEOMETRIC TOWN - Get creative and "develop basic mapping and geography skills including the use of symbols, compass directions, scale, and grid coordinates," by creating a 3D Town - Peggy Healy Stearns - (photo of town featured above). Visit Parent's Choice for free building pattern printables (store fronts / town accessories), as well as map printables (cardinal rose, coordinate grid, etc)! Also, check out Fun Stuff To Do for lots of 3D solid patterns for your town buildings, and see their version of a Geometric Town! To turn this into a PBL project, combine the 2 activities! Make small 2D maps of your 3D geometric town. Share your town on a parent night! Pass out maps to the tourists (aka parents) and have them visit your Geometric Town! Note: You can also add fractions to your town, click here for details!